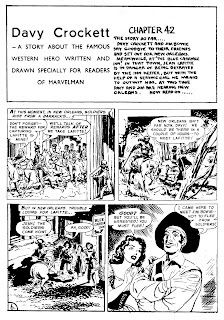 My previous post about Artie Simek ended with a look at some "Davy Crockett" pages drawn by Jack Kirby that had been scanned from a copy of Marvelman #231. These pages didn't seem to have been previously published in an American comic-book, so I speculated that they could have been either done for the U.K. market (after the Atlas implosion), or that they could have been inventory stories left from the "Davy Crockett" series that Kirby did for Harvey's Western Tales between 1955 and 1956. Allow me to digress a little. During the mid-1950's everybody was doing "Davy Crockett" comics. 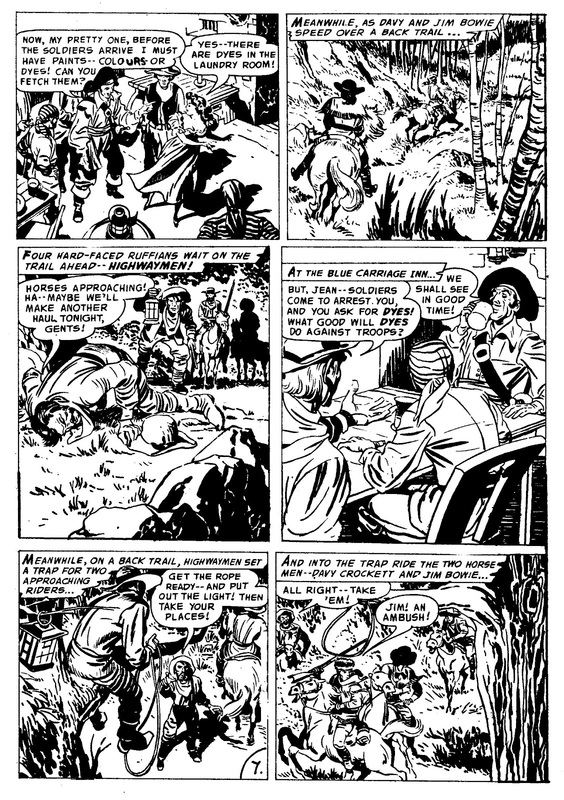 There was the aforementioned Kirby series over at Western Tales; Charlton had its own Davy Crockett comic between 1955 and 1957 and also featured the character in a series named Wild Frontier; Avon released a Fighting Davy Crockett one-shot in 1955; the character appeared in DC's Frontier Fighters comic; and Dell published several Davy Crockett comics based on Disney's TV version. On June 20, 1955, writer France "Ed" Herron and artist Jim McArdle began a new "Davy Crockett" newspaper strip (the ad at left and the first strip below are reproduced from the Spokane Daily Chronicle, courtesy of Google's newspaper archives). Herron had worked on and off with Kirby since the early 1940's, and is credited with co-creating the Red Skull, among other characters. The first Davy Crockett daily strip, from June 20, 1955. 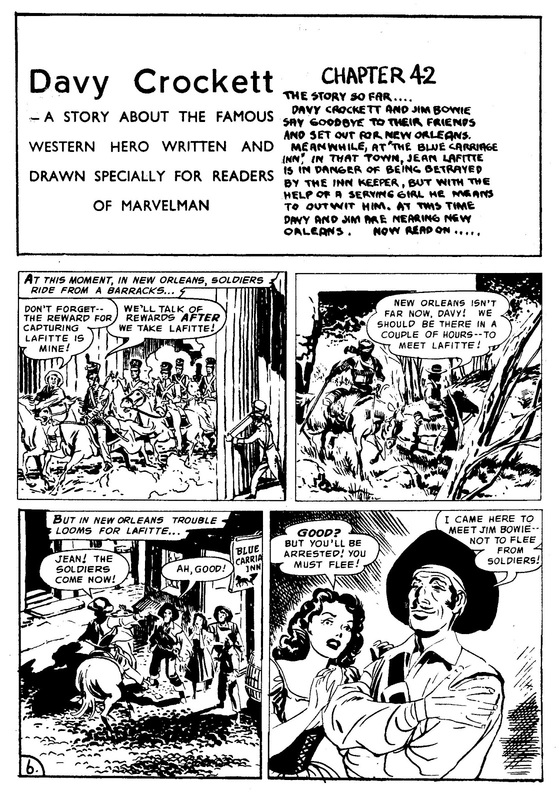 Back to the Kirby-drawn "Davy Crockett" pages from Marvelman #231. Dave Gibbons posted a comment on this blog noting that the pages looked like re-formatted newspaper strips. All the pages posted by Matt Gore have a white space at the top left corner every three panels, which is where the title of the strip would have appeared in a newspaper. So there was an extra clue. Then, in a discussion over at the Grand Comics Database's mailing list about the provenance of these Kirby pages, someone pointed out an article from early this year which contained the solution to the mystery. On March 2012, Jean Depelley wrote an article at BDZoom.com that explained where these Kirby pages came from. It turns out these Kirby pages were also published in France (a decade after their U.K. appearance) in Zoom #15 (October 1968). From Zoom #15. Check BDzoom.com for more scans from this story. From Marvelman #231. 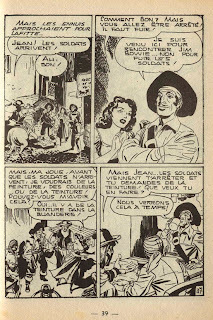 Note what a difference Artie Simek's lettering makes compared to the French version. 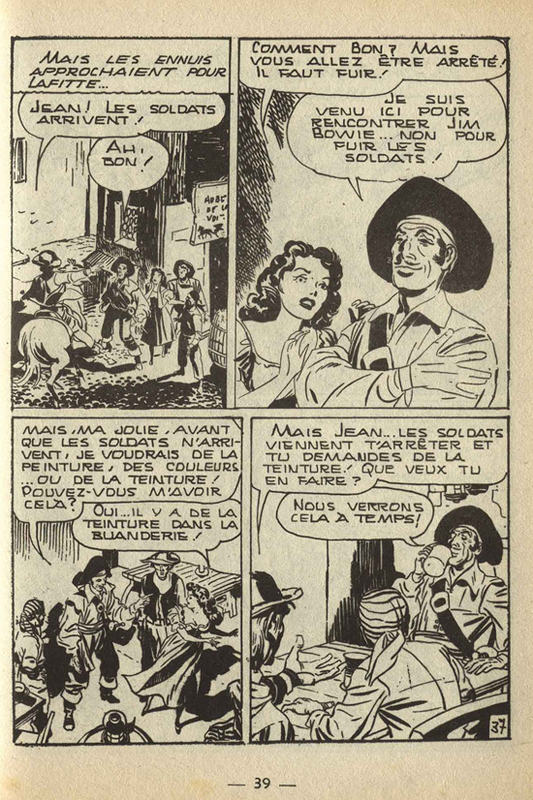 In his article, Jean Depelley describes the discovery of this story by French fans, their failed attempts to trace it to an American comic-book publication (they also considered the stories in Western Tales as a possibility) and their arrival to a conclusion: that these are newspaper strips Jack Kirby ghosted for Ed Herron's Davy Crockett strip during a transitional period in early 1957 (which would apparently date them before the Atlas Implosion). The evidence is in the BDzoom.com article: the "Columbia Features Syndicate" copyright notice, the "Herron/McArdle" signature in a later strip, and the fact that the continuity of the Kirby strips flows naturally from previous episodes drawn by another artist (showing that Kirby's pages weren't a stand-alone work, he was following somebody else's story). So that's a minor mystery solved. There are probably other fans who were aware of the fact that Kirby ghosted these "Davy Crockett" strips (it's unlikely that nobody else has noticed this fact in the 55 years since the strips' original appearance), but Depelley's article is the only place I've seen this documented. One final digression: I remembered Depelley's name from his appearances in the Jack Kirby Collector, usually in the letter columns but also as an occasional article writer. And as revealed by Tom Scioli in his Angouleme diary early this year, Depelley is also working on a Jack Kirby biography focusing on his war years. As Scioli describes it: "He’s put together a timeline of when and where Kirby was during the war, based on Jean’s interviews with the children of the soldiers Jack was stationed with. He’s visited the sites of various battles that Kirby had been involved in." Sounds like this could be a really good book. Depelley has written a series of "Adventures of Private Kirby" posts over at BDzoom.com which show some of his research. I haven't read them all yet, but look forward to doing so soon. I find interesting that the panels seem to be cropped and adjusted. Not only the wordballoons have different shapes, sizes and placements, but the panels are taller and narrower. It seems that there was some major intervention in the artwork's backgrounds, which are very different (at least from what I can see in the pages you posted). It also seems that there are some panels missing from the original publication, compared to the page you posted in your previous entry (the third and fourth panels from the french edition are the first and the fourth panel from the Marvelman #231 reprint). Nice article. Longtime Kirby archivist and collector Tom Morehouse checking in. Thanks to my friend Rand at the Kirby museum for linking me up. It should be no surprise that 1957 is also when Kirby was ghosting for Frank Giacoia on Johnny Reb & Billy Yank for the NY Herald Tribune and would certainly, given the state of the comic book business and his personal economy at the time, been open to a gig of this sort. The copy of Marvelman 230 (the previous issue) which I have picks up the story line with Jim Bowie & Davy Crockett heading for New Orleans after the death of the native Crazy Gun and awaiting them in New Orlans is Bowie's friend Lafitte. I'd be interested in knowing where 231 leaves off as it would give an idea of how long Jack ghosted the strip. The idea of a daily strip is clearly reinforced by the spacing of missing captions every third panel in the upper left hand corner of the panels where the title & possibly byline would appear.